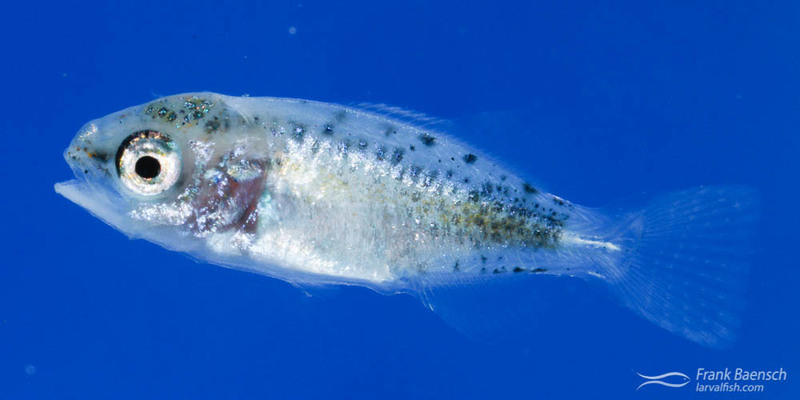 Pacific chub larvae (Kyphosus sandwicensis) were raised from wild-spawned eggs at 77-78F on wild copepods. First record of Pacific chub culture. Sea chubs or ruddefishes (Kyphosidae) are primarily tropical, schooling, herbivorous, coastal reef fishes comprising 4 genera and 11 species. They have a medium, often silver, moderately deep and compressed body with a small head and short snout. Chubs often congregate in great numbers to spawn. Juveniles frequently occur offshore around drifting debris and algae. In some areas in the world chubs are important food fish. In others, they are considered unpalatable. Chubs have no value to the aquarium trade and are not aquacultured. Chubs are common in Hawaiian coastal waters and spawn throughout the year. Pacific chub (Kyphosus sandwicensis) juvenile reared in the laboratory. Kyphosus sandwicensis was reared in 2011-2015 and, again in 2018, from eggs collected in neuston net tows. The eggs are pelagic, spherical and measure about 950 um in diameter. Multiple yellow pigment dots run along the embryo. Newly hatch K. sandwicensis larvae measure 2.6 mm TL and have unpigmented eyes, undeveloped jaws, a large yolk-sac and a yellow pigment pattern along the body. They start feeding 3 days after hatching at 3.6 mm TL and can feed on large copepd nauplii and copepodites. Preflexion larvae have a yellow pigmented, elongated body and a straight gut. Postflexion larvae develop a darkly pigmented, moderately deep body and a coiled gut. Other features of the larvae include weak head spination, a small air bladder over foregut and a long pelagic juvenile phase. The larval period of this K. sandwicensis is about 20 days. Chub (Kyphosus sp.) larvae reared in the laboratory. K. sandwicensis larvae grow and survive very well on copepods throughout the rearing phase and have no special culture requirements. Two culture trials in 2018 demonstrated that the larvae also grow and survive well when fed only rotifers and Artemia sp. (enriched with Isochrysis sp.). K. sandwicensis juveniles are not aggressive and grow fast on artificial diets. This species is very easy to culture but has little value as a food or aquarium fish.